Do you have a handle on basic physics terms and concepts, but your problem-solving skills could use some static friction? 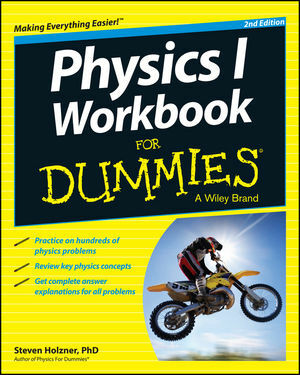 Physics I Workbook For Dummies helps you build upon what you already know to learn how to solve the most common physics problems with confidence and ease. Physics I Workbook For Dummies gets the ball rolling with a brief overview of the nuts and bolts of physics (i.e. converting measure, counting signification figures, applying math skills to physics problems, etc.) before getting in the nitty gritty. If you're already a pro you can skip this section and jump right into the practice problems. There, you'll get the lowdown on how to take your problem-solving skills to a whole new plane—without ever feeling like you've been left spiraling down a black hole. When push comes to shove, this friendly guide is just what you need to set your physics problem-solving skills in motion. Steven Holzner, PhD, was an educator and contributing editor at PC Magazine.